Her future depends on a US government programme that the president, Donald Trump, has attempted to shut down. Known as Deferred Action for Childhood Arrivals (DACA), it shields nearly 800,000 people from deportation, all of whom were brought to the United States illegally as children. Last September, Trump moved to end the programme, prompting a flurry of lawsuits. On 9 January, a federal judge in San Francisco, California, ordered the government to continue DACA while one of the court cases proceeds. Former president Barack Obama established the DACA programme in 2012 to give young, undocumented immigrants access to legal employment and more forms of﻿ state or private financial aid for university studies, among other things. Unlike other undocumented immigrants, DACA participants — also known as 'Dreamers' — are able to apply for a driver’s licence and obtain a social-security number, which makes it easier for them to find work and open a bank account. To enrol, immigrants must prove that they came to the United States before their sixteenth birthday and have a high-school diploma or are studying for one, among other requirements. Those who are granted DACA status must apply to renew it every two years. Without such protections, young undocumented immigrants are at risk of being sent back to home countries they might not remember, and whose language they might not speak. Trump’s move last year to end DACA prompted lawsuits from 19 states and Washington DC, among other challengers. The case that ultimately led federal judge William Alsup to order DACA’s reinstatement was filed by the University of California system — which estimates that some 4,000 of its students are in the country illegally, and says that many are likely eligible for DACA status. Valdez-Ward, who came to Houston, Texas, from Mexico City when she was six months old, says that even with DACA protection, she was ineligible for many government grants and internships that are available only to citizens. Still, DACA has allowed her to work and pay for her education by winning grants from private foundations. “If my status expires, there goes all of my funding,” she says. 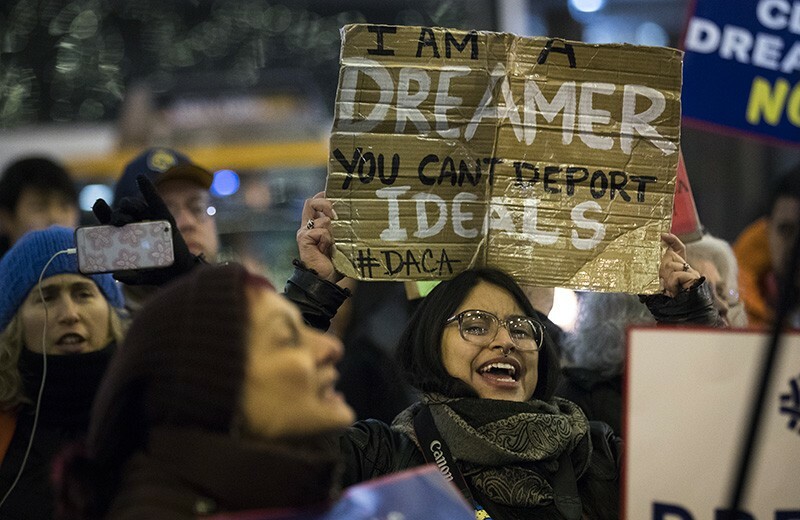 Adding to the confusion over DACA’s future, Trump and leaders in the US Congress are attempting to negotiate legislation to overhaul US immigration policies — which could end DACA, or shore up the status of immigrants covered by the current programme. On 11 January, a group of six Democratic and Republican senators announced a compromise that would give DACA recipients a path to citizenship while bolstering border security, but Trump rejected the plan. “The so-called bipartisan DACA deal presented yesterday to myself and a group of Republican Senators and Congressmen was a big step backwards,” he tweeted on 12 January. Trump and his administration have argued that Obama lacked the authority to establish the DACA programme.